In October, I made a Freedom of Information Act request of the Department of Homeland Security, to ask for records referencing me in DHS databases. The response took a bit over three months to come back, and included 83 pages. Many pages were simple records of my comings and goings. Some pages offer a paragraph of detail that explains the result of a secondary immigration screening. 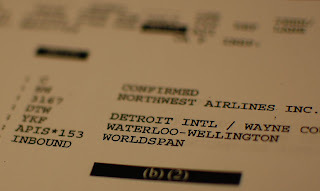 This page is the APIS data that Northwest Airlines sent to the DHS in advance of a commercial flight from Kitchener-Waterloo to Detroit.